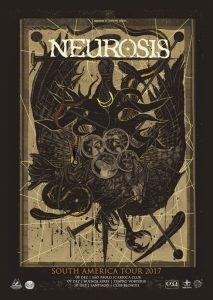 In December South American fans can finally experience the live intensity of heavy music pioneers, NEUROSIS. For the first time, the band will deliver their cathartic concert experience to South America, performing shows in Brazil, Argentina, and Chile. Over three decades, NEUROSIS has produced eleven studio albums, performed on stages around the planet — each record, each song, each show and each studio experience pushing the band one step further along on a lifelong path of spirit and sonic experimentation. For the first time in South America, local audiences will feel the trance like power of NEUROSIS’ massive riffs. These South American shows are produced by Brazilian booking agency Abraxas in partnership with Xaninho Discos, beginning in São Paulo, Brazil, on December 8th at Carioca Club, followed by shows in Buenos Aires, Argentina, on December 9th at Teatro Vorterix and Santiago, Chile, December 10th at Club Blondie. Noisey Brazil recently interviewed NEUROSIS’ Steve Von Till about the band’s ongoing legacy and first shows to the South American continent; read it at THIS LOCATION. See a multi-part Steve Von Till Demovids feature on his live setup with Nate Newton from Converge playing HERE, and see the amazing live video of Scott Kelly performing “Stones From The Sky” acoustic on the edge of Crater Lake with Revolver Magazine’s new No Distortion series HERE. Released in September 2016, NEUROSIS’ acclaimed eleventh studio LP Fires Within Fires is available now on CD, LP, cassette, and all digital platforms through the band’s own Neurot Recordings; see all bundles and options RIGHT HERE. Stand by for additional upcoming NEUROSIS live actions for 2018 to be announced.